was there that the Great War broke out. By the time he left the school at the age of 18, his father was commanding a section of the huge British base at Etaples in France. Patrick did no more than find his way to France to see his father. The Colonel was furious but Patrick had a wonderful few days looking around and breathing in the wartime atmosphere. weapon of war so he was transferred to the Royal Flying Corps, and a year after joining up he was posted to France as a second lieutenant. His duties at first were spotting for artillery, that is directing the fire of the British guns, and photo reconnaissance. both sides and short of fuel to land successfully behind British lines.For this exploit he was awarded the Military Cross. At the end of the year he was promoted to captain and put in charge of a flight of 6 planes. One of his more unusal exploits was to take his father for a joy-ride over the front lines, fortunately avoiding contact with any enemy aircraft. Though as an air ace he was not quite in the class of the Red Baron Richthoven or Captain Albert Ball, he succeeded in shooting down 11 enemy aircraft. On a later occasion he narrowly escaped death when his plane was shot up over Ypres, lost its propeller and finished upside down in a shell hole. Patrick nearly drowned in the water, but was rescued and managed to repair the engine. For these exploits he was awarded a bar to his Military Cross (equivalent to getting another MC). commission in the Sherwood Foresters and became a Flight Lieutenant in the new service. Like many servicemen at the end of the war, he had decisions to make about his future career. Whether to leave the armed forces and make a living in civvie street or to stay in the newly formed RAF (if the authorities agreed) and try to build a career. Patrick Huskinson decided on the second course of action. After the war he was with the Army of Occu- pation in Germany with the rank of Major. When the Royal Flying Corp was reorganised as the Royal Air Force, he resigned his commission in the Sherwood Foresters and became a Flight Lieutenant in the new service. He was seconded as an instructor to Cranwell which had recently formed to train officers and tradesmen for the RAF. Then came the point which was to turn him from a fighter ace of the Great War into a desk bound warrior of the Second World War (which is not intended to belittle his later achievements which were of national impor- tance). A policy was announced which re- quired all RAF personnel to specialise in some aspect or another of service which would be valuable to the future development of the new force. He opted to specialise in armaments. In 1923 he was posted to Eastchurch to learn something about the subject and emerged from the course rather disillusioned. He found the instruction consisted largely of naming of parts and the instructors and the equipment inadequate for much progress to be made. However he was posted as Armaments Staff Officer to various stations until he ended up at the Air Ministry with the brief of finding ranges in the UK for training purposes, bombing practice and suchlike which had not existed up to that point. This is when he built up invaluable experience in dealing with civilians basically unsympathetic to the needs of the RAF and the importance of their role in any future war. He had to overcome all sorts of ‘nimby’ objections such as the noise, the in- convenience and the disturbance of livestock. Over a period of four years he managed to establish four important ranges for traing and, equally important, his work brought him in contact with future great leaders of the air force such as Dowding, Tedder and Harris. His duties also took him to Iraq (at that time a British Protectorate) and it was whilst he was serving there that his father, Colonel Charles Huskinson, died. Sadly Patrick could not leave his post to attend his father’s funeral. Promotion came steadily. In 1933 he was made a Wing Commander and in 1937 a Group Captain in charge of two bomber squadrons. But he stepped into what was to become his main role in World War Two, in 1938 when he was appointed the RAF repre- sentative on the Ordnance Committee re- sponsible for the development of all manner of guns, bombs and ammunition. Soon after the start of the war he was made an Air Com- modore. War broke out in 1939. Shortly afterwards, Winston Churchill became Prime Minister and his single minded aim of winning the war led him to appoint men to crucial positions who had the vision and the drive to bring this about. Such a man was Lord Beaverbrook, the press tycoon, who was made Minister for Aircraft Production and under him was Patrick Huskinson as Director of Armament Production. Huskinson was important enough to take part in conferences at Prime Ministerial level. In his new role he had to consider and assess any and every suggestion for novel types of weapons. In his autobiography entitled Vision Ahead, he mentions some of the weirder examples, including tennis balls filled with explosives (a kind of early bouncing bomb), rats dropped by parachute with explosives tied to their tails and an early form of germ warfare - containers of malarial mosquitoes dropped by parachute. None of these passed the essential test of being practical. Older Farndon residents who remember anything of Patrick Huskinson associate him with two things, his design of big bombs and the fact that he was blinded during the London blitz. His injury came about in April 1941. He was living with his wife Molly (he had married on 1940) in an apartment in Knightsbridge close to his work in the corrdors of power. He left work at the Air Ministry at about 9 p.m. and after a meal settled down to work at some papers. The air raid warning had sounded but he did not take shelter. In fact, as was his custom, he looked out of the window to watch the raid because he was always ready to learn from German bombing methods. As the bombing came closer they left the bedroom and went to comparative safety of the sitting room; they drank tea, she read a book and he did some more work on his papers. He rose to get his pipe from the mantelpiece and the next thing he knew he was being cradled in his wife’s arms whilst she told him that the apartment had been hit, he was badly hurt and that there was a fire. He became aware that he was bleeding and that he was unable to see anything. She helped him out of the apartment to safety and he was taken to hospital where wounds were stitched, bits of wood, glass and metal were removed from his body and he became that he had lost his eyesight. His eyes had been flooded with blood and he was permanently blinded. Here- after he wore dark glasses and walked with the aid of a stick. Despite all this, things could have been worse. The bed where they had been lying only minutes before the bomb fell lay crushed beneath a large slab of concrete. His determination and courage helped him to get over some of the worst of the inconven- iences. He removed the glass face from his watch so that he could tell the time by touch. At mealtimes, crockery and food were always placed in the same positions so that he couldvisualise their position by imagining them in relation to the points of a compass. He learnt to read blueprints by having the outlines gone over with a toothed wheel. He could form a mental picture of them by turning the sheet over and feeling the pricklings like a form of Braille. Inevitably he relied heavily on help from those around him, especially his wife. The value of his work to the war effort was so great that his room was converted into an office and he was given two personal assist ants and a secretary so that he could conti ue. 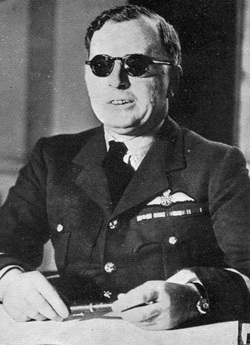 Even after he was invalided out of the RAF in January 1942 they could not dispense with his services and he was invited to be President of the Air Armaments Board. This brings us to his invaluable work in the design of big bombs. When he became responsible in the early days of the war he was very disappointed with the bombs available to the RAF in order to retaliate against Germany for the blitz on British towns. They consisted mainly of Gen eral Purpose bombs of 250 pounds and 500 pounds which had comparatively little pene- trating power against well protected targets. He set about remedying the situation with the design and production of ever increasing cal- ibre of bombs from 1000 pounds medium through to 4000, 8000 and 12000 pound bombs. Even these did not do the job against strategic road tunnels, viaducts and other massive and well protected targets. By the end of the war he and his team had pro- gressed to the production of ‘Tallboy’ of 12000 pounds and ‘Grand Slam’ of 22000 pounds (ten tons) for use against specialist targets. Together with Squadron Leader Gar ner he won public acclaim as ‘one of the boys from the backroom who helped design the big beautiful bombs which were Britain’s new present to Germany’. This was only a part of the work of his department and a full account of his achieve ments would require a much longer article. By the end of his active service life he had attained the rank of Air Commodore and had been awarded the CBE to add to his MC and bar. He received the insignia of this award from King George VI. In addition and as a result of his close collaboration with the Americans, he was presented with the American decoration the Legion of Merit.